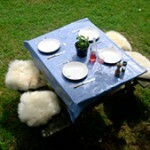 Upcycle these pieces of sheepskin off cuts created from making the sheep and bull footstools. Kitchen chairs ,Pushchairs Rowing bums & Picnics. Approx.size 30 cm by 30cm.